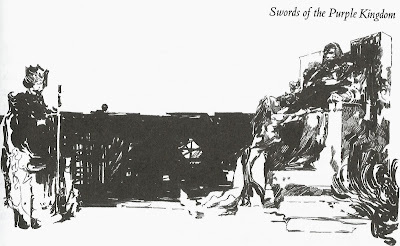 I have read many stories by Robert E. Howard over the years, but today read "Swords of the Purple Kingdom" for the first time. This story about Kull, exile from Atlantis and usurper king of Valusia, was written in the late 1920s and not published in Howard’s lifetime. I read it in the 2006 collection by Del Rey full of illustrations by Justin Sweet. I can’t say I like these illustrations; they are vague and difficult to “read,” and people’s faces seem expressionless and flat. Kull, as king, has saved the decadent kingdom of Valusia from foreign invasion and through his wise policy improved the kingdom’s economy. Still, there are those among the Valusian aristocracy who resent the rule of a foreign barbarian, and of course foreign powers would be happy to see Kull off the throne so they could conquer Valusia themselves. Two Valusian nobles, one looking to put himself on the throne and another simply in need of money to pay off the debts he has incurred from high living, join forces with the commander of the army of a foreign state and through trickery capture Kull and imprison him in a ruin on the edge of town. 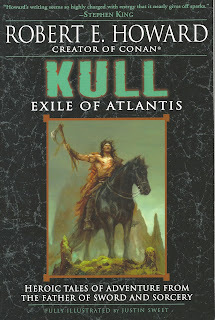 By chance, Kull is rescued by a beautiful girl and her lover, another foreign adventurer. The story climaxes with Kull and the two lovers atop a crumbling staircase, fighting off dozens of soldiers. 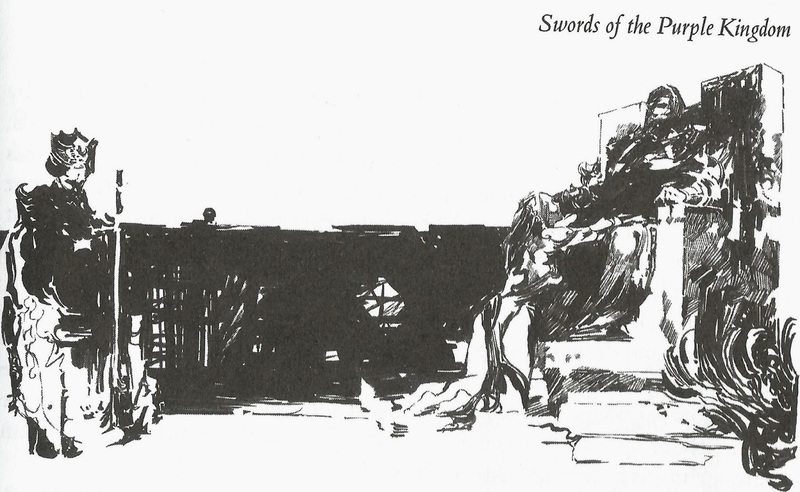 The most interesting part of the story is the revelation of who the indebted conspirator is: it turns out to be Dondal, a young man friendly with Kull and his court, in fact the nephew of one of Kull’s most trusted advisers. Kull’s right hand man, Brule, yet another foreign adventurer (the people of Valusia are so decadent that most of the important military and political posts are held by foreigners) and one of Dondal’s drinking buddies, blames the whole conspiracy on Dondal’s uncle’s refusal to pay his nephew’s debts. “Want will make a rogue of any man,” Brule intones, moodily. A little social commentary from Howard, perhaps, sympathizing with spendthrifts and thieves and denouncing wealthy misers? Maybe the fact that Dondal’s uncle was described early in the story as looking like a merchant should have tipped me off to the fact that he was the “root cause” of the crisis; as Michael Moorcock in the foreword to Conan the Phenomenon points out, Howard and his heroes have no fondness for merchants and priests. As a straightforward adventure story this is not bad, but it feels smaller and flatter than the best Howard stories. Kull is not a particularly interesting character, and this story didn’t achieve a very high level of fear or excitement or have any particularly memorable scenes. And since there are no wizards, monsters, or priests who worship alien gods, you wonder why this story is set in the forgotten past of Atlantean times at all. Howard could have used this same plot in a story set in Renaissance Italy or the medieval Near East, any milieu equipped with walled cities, foreign mercenaries, and backstabbing traitors. Still, a marginal positive review for this one.